Using the power of play to engage audiences in conservation. I’m excited to share with you the second interview in my “Innovations in Conservation” series. 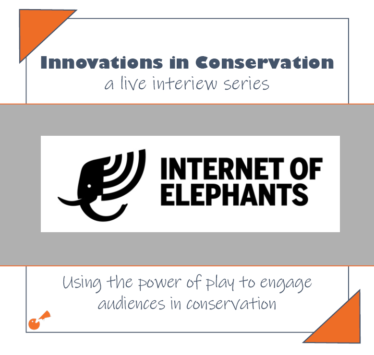 For this interview, I spoke with Gautam Shah, the founder of Internet of Elephants. His company creates games, data visualizations and augmented reality experiences to connect wider audiences with conservation efforts. The universal appeal of play and how games can offer social, participatory and emotional experiences. Featuring individually-named animals can create greater empathy for wildlife overall (for example, the way Cecil the Lion did). How to bring data and information to life, and even the need to broaden the definition of data. Starting from a perspective that people do care to avoid creating distrust when engaging audiences. Linking global issues to actions that can be taken closer to home. How do you link gamers’ conservation-related behavior to specific experiences in your games? What would be your dream wildlife situation to turn into a game? How do you choose which animals to feature? Do you stick to charismatic animals and/or is there consideration for threatened or endangered animals? How important is innovation for the conservation sector? Every conservation organization has hundreds of these stories to tell. Everyone feels emotionally attached to the work they do and the animals they follow on a daily basis. They have such intimate details of these animals’ lives. Often these animals’ lives can be pretty boring; they do the same thing and it’s repetitive. But they have such intimate details of it. When we talk about bringing these stories out in various ways, whether that’s games or visualizations or other approaches, that’s what gets people excited. They feel that these stories would never get out to a larger audience. And it’s not necessarily their remit as a scientist to make that happen. But they feel if it were to happen then that would be fantastic because: (a) I love the work I do and great if other people see it and (b) it gives more exposure to the type of things that we’re working on. We start from a position that you care. We often think that people don’t care and we have to get them to care. We have to get them to do something. We’ve got to get them to take an action. We’ve got to get them to change their behavior. Of course, we do want people to change their behavior over time, but we also recognize that if the entire thing is us trying to get them to do something, then there’s some distrust from the very beginning that we might be creating. We want to start everything from a position of “you’re in this game and therefore you must care”. All the tone from everything we do and the way the messaging is, is all around that. The outcome, the action we’re looking for in our next game is: What can you do within your own neighborhood? What can you do for an orangutan that’s far away? Expose people to the things they can do locally. Expose them to the forest preserve that’s near them locally and the animals that are there. You’re having this fantastic experience with orangutans, but did you know that in your own neighborhood there is in fact nature and wildlife and that’s potentially the best place for you to get involved?